Melinda Smith’s Salesforce MVP sticker is displayed on her laptop proudly next to a sticker for Two Wit, a podcast she co-hosts. Gemma Emmett, a solutions architect in the UK, sports an old-school Salesforce logo decal alongside a sticker of Success Cloud’s Blaze. Salesforce MVP Brian Kwong is reluctant to apply his pony sticker anywhere — and has considered framing it instead. And Rob Cowell, a Salesforce Developer in London, is building a sticker-trading app because his swag cup overfloweth. 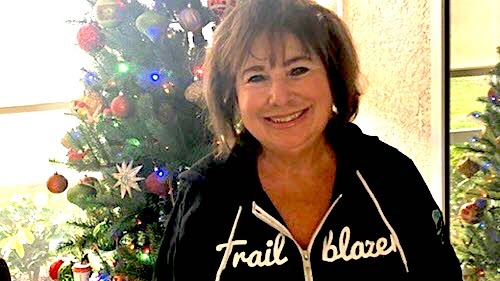 The Trailblazer Community is fanatic about Salesforce stickers. But what caused this obsession? People have used stickers for personal expression since ancient Egypt. Laptop stickers are just this generation’s incarnation. From tech campuses to college campuses, stickers make statements on laptop lids. Salesforce just happened to elevate this trend in an almost cult-like way with incredibly charming mascots and eye-catching artwork. Stickers are handed out like candy around Salesforce HQ in San Francisco. In fact, there have been 600-700 orders for them to date*. At virtually every event, product launch, recreational activity, holiday gathering, and more, you’ll likely find a Salesforce sticker commemorating it. You can also get ahold of stickers at our local events and community meetups, as rewards and prizes for campaigns, and even from sales reps on the road. Not only are stickers an instant icebreaker, they’re also a reminder that our enthusiastic community is made up of individuals with unique interests. 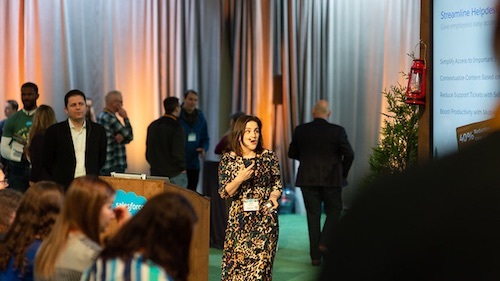 Zarina Varley Scott, a Certified Admin and Community Group Leader near Toronto, saw a release logo she connected with — AppExchange's Appy playing a trumpet. "I play the trumpet and I love Appy. I told Domenique Sillet how much I loved it, and she had some printed." Trailblazer Community employees (from L-R) Sofia Rodriguez Mata, Jessica Galiana, and Alex Pisani with the good stuff. 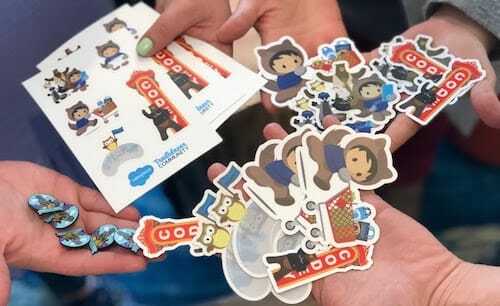 Dreamforce ‘18 played host to a sticker swap at the Trailblazer Community Cove. It was the brainchild of Community Managers Sofia Rodriguez Mata and Alex Pisani, after years of witnessing sticker hysteria first-hand. 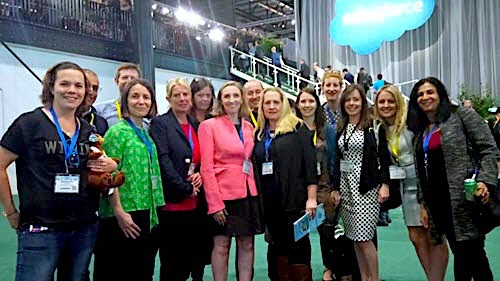 After a dry run at Connections in Chicago, the duo was ready to go big at Dreamforce. “Folks had folders and sticker organizers ready specifically for exchanging stickers,” Rodriguez Mata recalls. And what were the most popular stickers? “The Pride Astro is always a big hit — and the Lionheart Astro and Blaze stickers are asked about a lot because they're not as widely distributed,” she says. One sticker is more coveted than any other — so much that we won’t reveal what it looks like here to prevent unscrupulous duplication. Instead, let’s just describe it: Astro wearing a Golden Hoodie. There are other specific details that make this sticker special that we won’t divulge here. However, what makes this sticker so rare is the simple fact that Golden Hoodies are only bestowed upon a small group of Trailblazers who have transformed their careers via Trailhead — and this mega-rare sticker is only awarded to those select few living #lifewithgoldie. This is why it’s become so coveted among Salesforce sticker collectors. But Trailblazers aren’t sitting around waiting for a Golden Hoodie Astro sticker to fall into their laps. Sharing in Salesforce sticker joy continues to happen everywhere Trailblazers go, both digitally and in real life. Salesforce MVP '14-'17, Jennifer Shier fondly displays her two favorites: a self-portrait gifted to her by Sillett, and an Explorer Einstein sticker that symbolizes the great adventure she’s on with Salesforce Analytics. Texas-based Admin Zachary Banks has built up an impressive volume of stickers to trade or give away to sticker newbies. So has 7x Certified Admin Jeanette Jett, who’s started an honest-to-goodness sticker album. Salesforce MVP Amy Oplinger is even thinking about investing in various laptop covers since her laptop lid is at maximum capacity. Looks like the devotion to these little adhesives isn’t just a passing fad. That a small piece of swag brings joy to many, carries the spirit of Trailblazers around the world, and signifies so much — equality, innovation, analytical-thinking, empowerment and more — is a true testament to what makes our community unique. What’s your favorite Salesforce sticker, and why? Email blog@salesforce.com with a photo of you and your sticker. We’ll include stories and photos in a Part 2 of this post. *This is not a sponsored post, but if you're wondering, we get a lot of our stickers through custom sticker manufacturer Sticker Mule. Updated Jan 2019 for accuracy.